“There are a range of ages and diverse cultures together, learning to appreciate a variety of activities in a safe environment. The organisers have done a fantastic job in bringing this community together.” – Meersbrook resident. 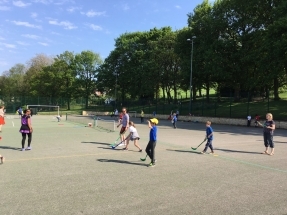 We are very grateful for the support we have received from South Yorkshire’s Community Foundation and the Big Lottery Fund for our Sport in the Park sessions. 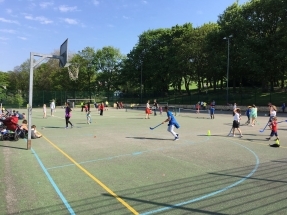 Every Thursday after school, 3.45-5pm, during term time, is a free, multi-sports, relaxed drop-in session taking place on the Multi Use Games Area in the park. Supervised by volunteers and a qualified coach, Jay Baker, with parents, childminders and after school club workers taking part and helping out, children have the opportunity to get involved in activities such as football, tennis, archery, hockey, volleyball and basketball, alongside litter picking with equipment provided. Volunteers and coaches are first aid trained, insured and DBS checked. “I like these sessions because it gives the children a variety of different things to do as well as them keeping fit, the adults also get involved which gives the children encouragement to join in.” – Meersbrook resident. You can read the evaluation of the sports sessions here.